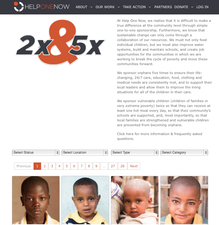 Sugar Maple Interactive announces that Help One Now has implemented its new child sponsorship module. The module, a component of the company’s communication and support portal REACH, provides a complete set of tools for an organization to simply and effectively manage and run a child sponsorship program using their existing website. Organizations manage the module using its simple, web-based administrative tool with built-in, detailed reporting. Administrators can add background information, upload multiple images, add custom attributes such as age and gender, and offer multiple sponsorship levels per child. In addition, administrators can manage online and offline sponsorship payments and track past-due donations. The module can also automatically notify sponsors of any past-due donations. Using the module, supporters view, read about and select a child to sponsor. After sponsoring, the supporter will receive regular updates about their sponsored child. Simple import tools allow an organization to be up and running with the new child sponsorship module within a matter of days. To learn more or to get started, please contact Sales and Marketing at 919.622.2594, or visit us online at www.reachapp.co. To view Help One Now’s child sponsorship program, please visit www.helponenow.org.